​The Bell Rouge Motorcycle Helmet is the half helmet that covers the lower half of the face but can be converted into a¾ by extending the muzzle. This stylish and innovative motorcycle helmet is designed not just for protection but also for the comfort of the user. Made from lightweight but durable materials, it has room for goggle strap that the rider can wear when needed. Its parts are detachable and washable so that it is easy to clean and maintain. 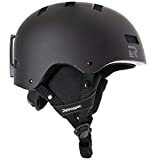 Bell Rouge Motorcycle Helmet, priced at around $250, is a reasonably priced helmet that can help to make every motorcycle trip a pleasurable experience. Pure Attitude.Purpose-built to guard against the elements, the new Rogue has the look of a half helmet with the comfort of a three-quarter. Featuring an adjustable and removable muzzle, the Rogue offers an innovative solution for exceptional rider comfort. It has detachable and washable parts so that they quickly are cleaned and maintained. The muzzle can be adjusted so that it won’t rest on the bridge of the nose, causing discomfort. It comes in various sizes to accommodate all types of customers. It has integrated speaker pockets for speaker deviceIt can be put on and taken off easily because it has Fidlock magnetic connection. The open face and liner protect the rider against wind and noise. It has a neck roll and shroud at the back to protect the neck from impact. The muzzle protects the rider from the cold wind. The muzzle is easy to attach and remove when necessary. The half helmet is comfortable, light, and strong. The Bell Rouge Motorcycle Helmet has a unique design that make it a real head- turner. There is space to accommodate a communication device. 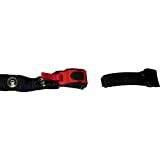 G﻿﻿﻿﻿oggle﻿﻿﻿ strap can be kept inside and removed when the rider wants to use goggles. Bell Rouge Motorcycle Helmet is designed to suit all styles of motorcycles. It has been certified by the DOT. Buyers will enjoy a 5-year warranty. While the helmet is almost perfect, some users have noticed that the muzzle is not sturdy enough. It was also mentioned that the detachable linings also move when the motorcycle is running. There were complaints that the liner rubs on the nose, causing discomfort. ​When wearing the helmet, the muzzle should be adjusted so that it won’t rest on the bridge of the nose and cause discomfort. Adjust muzzle so that it won’t rest on the bridge of the nose. Breath guard of the helmet should be used during cold weather so that the muzzle is protected from the wind. The helmet should always be worn while driving so that bugs and dirt will not hit the face or enter the eyes. 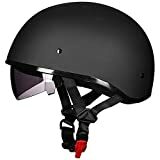 Bell Rouge Motorcycle Helmet is uniquely designed, and motorcycle riders wearing it have become head turners as people aim to get a good look at this stylish helmet. ​​To keep clean the helmet and make them last longer, they should be cleaned and maintained regularly. Stuffing dirty gloves inside the helmet is unhygienic because the gloves contain sweat that has dried up, dust, and dirt. Likewise, placing the used helmet inside a closet should be avoided because it prevents it from getting aired and dried. ​For hygiene purposes, motorcycle helmets should be cleaned regularly. The inner lining can serve as a home to microbes if left not cleaned for a long time. Also, it can emit an offending smell as well. 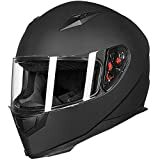 ​Bell Rouge Motorcycle Helmet is the best motorcycle helmet for motorcyclists who prefer to enjoy the scenery while driving without worrying much about protection. The half helmet can give riders that windblown look that most riders aspire to have. With this stylish but durable helmet, motorcycle trips can bring delightful experience.